Last year, the Boston Bruins emerged from the bubble group and ended up as one of the elites in the NHL. Now, after many Bruins’ fans were just hoping for development and playoffs a year ago, the Stanley Cup is now the goal. A big reason for the change in expectation is that many of Boston’s young players broke out a season ago. Guys like Charlie McAvoy, Jake DeBrusk, Danton Heinen and Sean Kuraly all came to the NHL and outperformed expectations. If Boston wants to continue their upward trajectory and compete for the Cup this season, they’ll need more players to breakout. Considering some of the losses the team suffered through this summer, there is plenty of opportunity in Boston. With Rick Nash contemplating retirement, a spot is now open in Boston’s top-six. Bjork was considered a big-time prospect as recently as a year ago and has the skills to play a top-six role in the NHL. He posted four goals and eight assists in 30 NHL games a season ago while also displaying strong offensive tools when adjusting to the big leagues. Bjork will enter this camp fresh off of surgery and ready to go. He’s mentioned many times how excited and motivated he is for the season, with the Winter Classic at Notre Dame being a huge push for him. Bjork has the skills to take over the hole left by Nash, and could be the next Bruin to emerge as a legit piece in Boston. Bjork has the skills but just needs the chance. With a good camp and preseason, he’ll get the look he needs. If Bjork finds himself on the second line this season, I could see him scoring 15-20 goals and breaking out for this club. A great chance awaits Anders. There’s something about open roster spots being left by men named Nash. 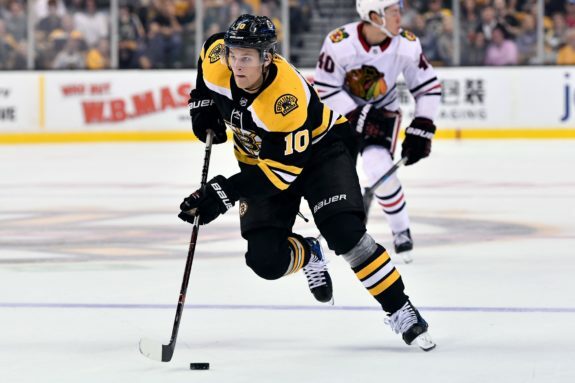 With Riley Nash heading to Columbus, a spot down the middle will be open in Boston this fall. Enter Jakob Forsbacka-Karlsson, the former BU pivot who was Boston’s second-round pick in 2015. Forsbacka Karlsson plays a very responsible game and can be labeled as a two-way center. He’s got great defensive instincts and should fit in nicely with the Bruins’ style of play and the type of player they love. He played for AHL Providence last season, posting 32 points in 58 games. The man they call JFK emerged in the AHL and became one of the better players for the P-Bruins by the end of the season. Personally, I think he is close to NHL ready. The opportunity has presented itself to JFK. He’ll enter camp with a real chance to make Boston’s roster in a bottom-six role. He likely won’t replace Riley Nash’s production (41 points in 76 games), but an NHL job is certainly up for grabs. A good camp by the young pivot likely earns him his first NHL roster spot. That would be a big step forward for this prospect, and would certainly help the Bruins as they look to fill the hole left by the other Nash’s departure in free agency. Grzelcyk played in 61 games a year ago after grabbing an NHL job. He posted 15 points in those 61 games and gained more ice time and responsibility as the season wore on. This year, Boston enters camp with eight NHL defenders on the roster. Grzelcyk was rewarded with a two-year contract this past summer and is expected to be a contributor again this year. So what makes him a breakout candidate? Great question. 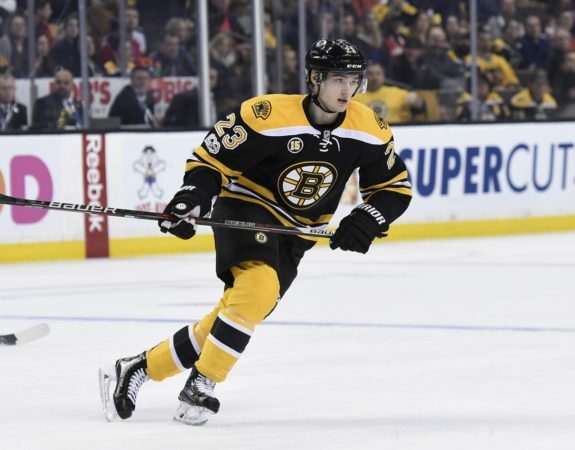 The thing is, there has been a ton of smoke surrounding a potential Torey Krug trade. Although I think that would be a poor idea one has to imagine that if Boston gets an offer they like they’ll pull the trigger. If they do, Grzelcyk would be the natural pick to replace Krug and gain the powerplay time left behind. Should that happen, a spike in role and offensive production would fall into Grzelcyk’s lap. Even if a Krug trade doesn’t present itself, you’d have to think that Grzelcyk sees an increased role this coming season. He’s got a cheap contract and his style is a perfect fit for today’s NHL. 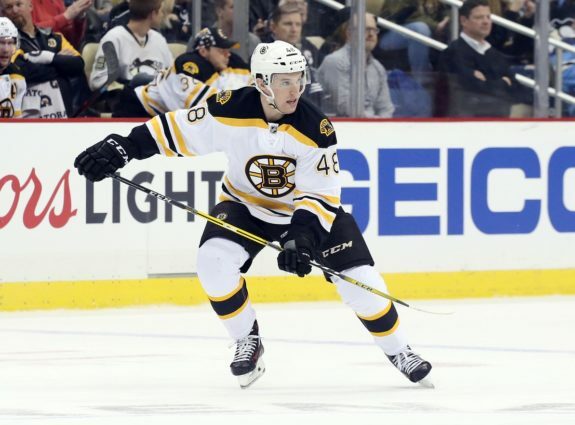 There’s a real chance that Bruce Cassidy relies on Grzelcyk more in his sophomore season with the Bruins. If that is in fact, the case, Grzelcyk could emerge in a big way.